What causes people to wait especially when things are too important to ignore? I do this. You may well do the same. Forwarding a prompt reply to an event is hardly a fair comparison to preparing your Last Will and Testament. The fact is a vast majority of people do not have a Will in place yet the same question applies. What are you waiting for? The bottom line is death is eventually going to occur with or without you having a Will in place. Don’t you want your wishes to be known to the people who matter the most? Are myths holding you hostage, preventing you from writing your will? You may be under the impression that having a lawyer draft a Will is expensive. This is not true. In fact, this small expenditure may be the best money you spend to have peace of mind. Every time you hear about an unexpected death -- a sudden heartache or a devastating traffic accident -- you make a mental note that your Will isn’t written. Even if you have a Will, you may feel a tinge of guilt knowing your Will hasn’t been reviewed for many years. You might be the type of person who is superstitious, believing that once you write your Will, you are sure to drop dead. Contrary to what you believe, it’s not likely going to happen. You need to plug in a belief, one which says that you will live for eternity since you alleviated the stress and anxiety of living without a Will. Your belief may be that if everything is owned jointly with your spouse and you have named a beneficiary on your registered investment, pension plan, and life insurance policy that there is no need for a Will. This may be true and applicable in certain circumstances but you are still missing information. What if your spouse passes away before you? 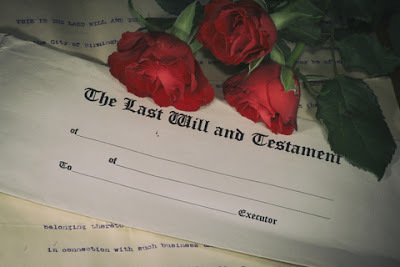 If this occurs, what if you are unable to write your Will because you suffer from dementia? What if you both pass away together in a car accident? The greatest challenge you may have is how to distribute your assets to family members while you attempt to be fair and equitable. Because the challenges are so overwhelming, you may choose to postpone the decision and opt to do nothing. This temporary strategy does not provide a solution. You take the chance of leaving everything you have worked to achieve in limbo. Having life insurance is one way to create a fair and equitable estate. This strategy can only work if you are insurable when you apply for coverage. Another challenge is waiting until your Will is perfected. There’s a danger in postponing the drafting of your Will. The reality is your life doesn’t stay the same which means that your Will won’t either and will require revising in the future. A divorce, lottery winnings, the birth of children and grandchildren will change your intentions. Therefore, you are not writing your Will on what may happen in the future. It’s now! It’s not tomorrow, a month or a year from now. You are writing your Will as if you have been hit by a city bus while walking to work. If this was the situation, ask yourself: “Who gets what if I can’t tell anyone?” Your Will speaks on your behalf. You may be tempted to take matters into your own hands by drafting your Will using a Will kit. Don’t do it. With so many complex issues and unexpected scenarios, you should not underestimate the value of first-hand legal advice related to your life’s circumstances. Even the most straight-forward life situation can have complex issues. You don’t want to mess things up by drafting Will instructions yourself and having them misinterpreted. Maybe you are looking at your financial picture and it is not exactly “picture perfect” but there is always hope. Without hope, well then everything would be hopeless. With so many different pieces making up your world – finances, career, relationships and health – sometimes the best way to see your world is through a pair of binoculars that can widen your focus. “An attitude of gratitude” can be the precise prescription you need to drastically change your life. Be grateful for your present income. Be grateful for your family. Be grateful for your health. Although these are concrete things you may see, touch and feel, others such as infinite power, endless possibility, and boundless opportunity may not be as obvious. These are the ones Stella Stuart shares. With a new attitude, your world is bound to change. 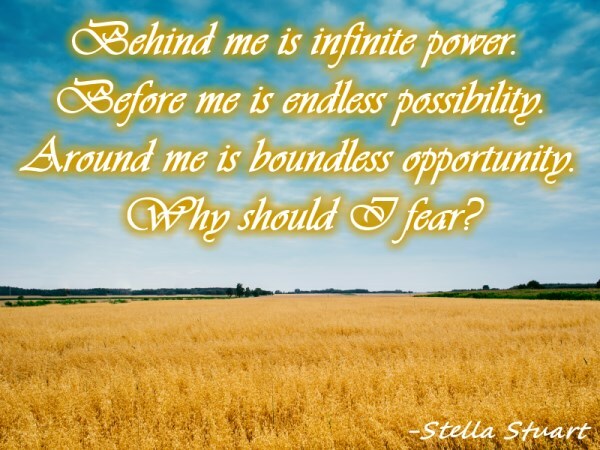 Stella Stuart sums her statement up with an all important question, “Why should I fear?” With so many things going for you, you will realize there’s no valid reason to be afraid. Where am leading you? You are now one week into the New Year and I am curious how well you are sticking to your New Year’s Resolutions and following through with your goals for 2016. I’m here to tell you that the first thirty days will be tough slugging. If you can make it through these days, the changes you are implementing will get a little easier. I discovered a new truth (at least for me it was). Bad habits have to be replaced with good habits. You can’t simply say “Bon Voyage” to your bad habit and hope you never see it again. The truth is you have to work at making your bad habits disappear. This sounds so elementary. You are reminded that “money does matter and so do your dreams.” In 2015, the blogs shared different ways to make things happen. “A year in review” might tweak your memory and enthusiasm. If you have concrete dreams, then you must turn them into SMART goals. If you are serious about saving money, then take baby steps towards savings. If you are serious about paying down debt, then plan to wage war on your debt. If you are considering retirement, you need to determine your sources of retirement income and lifestyle. If you are confused by taxes, gaining a better understanding can be achieved by reading It’s all in the Math. If you are thinking about purchasing a home, then consider all the factors involved with becoming a home owner. If your spending is out-of-control, you might try implementing a “Cash Diet” to get back on track. If you have difficulty talking to your partner about money, then you may learn more about what makes other people tick. If your investments are held with different advisors, you may want to understand the benefits of having one advisor who can see your whole financial picture. If you have never considered the benefits of life insurance, you may consider doing your family a favor. If you need to better understand your RRSP Contribution Limits, reading “The Road to a Successful Retirement” may change your perspective. Here’s the challenge. Even if you think you can’t change, I want you to believe you can. If you don’t feel ready for the change, then do it for the benefit the change will bring. Don’t overthink. Just Do It! Do the very thing you told yourself you wanted to implement in the New Year. Start now and slug through the process until you arrive at the point where you accomplish your goal. Congratulations for accepting the challenge because I know you can rise to the call. Remember the message that will get you to the other side, "Behind me is infinite power. Before me is endless possibility. Around me is boundless opportunity. Why should I fear?"